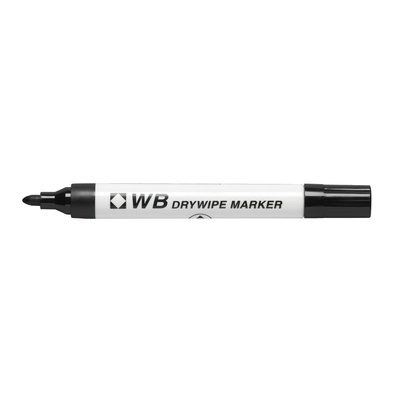 Create engaging meetings and presentations that engage the whole group with our Drywipe Markers Black. These slimline markers are suitable for use on whiteboards boards and can be easily removed with a dry cloth once the information is no longer required. Their easy grip and thinner barrel make them an ideal choice for younger children and perfect for group activities with smaller white boards. The low odour ink dries instantly to reduce the risk of a illegible, shiny finish but leaves no permanent marking on boards while the 2mm line width means allows for clear and legible content - even with the newest of writers. For large classrooms, we recommend purchasing the Mini Magnetic Whiteboard Erasers Box of 30 alongside these markers. Alternatively, and to add more colour to the board, we also stock Drywipe Markers Assorted 4pk which comes in an assortment of red, green, blue and black colours.